Besides offering professional service repairs/replacement on all mufflers and brakes, we also provide many other types of service for your vehicle. Please feel free to contact us with your specific needs. Description: Closely resembling a muffler in appearance, the catalytic converter is located in the exhaust system and has an outer shell made of stainless steel. The similarity with a muffler ends there as catalytic converters contain a catalyst made from a noble metal such as platinum, palladium or rhodium. A catalyst is defined as anything that induces or accelerates a change. At least one catalytic converter has been used on cars since 1975; today, cars may have two or more depending on the engine configuration and manufacturer. Purpose: Using its internal catalyst, a catalytic converter's job is to greatly reduce the level of harmful emissions in a car's exhaust. Namely, these are carbon monoxide, hydrocarbons and oxides of nitrogen. All of these emissions are serious health and environmental hazards, plus they contribute to the formation of photochemical smog. A catalytic converter changes these poisonous gases to harmless carbon dioxide, nitrogen, oxygen, and water. In a simplistic way, the catalytic converter can almost be thought of as an engine of its own. The converter uses fuel and oxygen to "light off" its internal catalyst, which consumes a large portion of the gases flowing through the converter. Although a converter greatly reduces emissions, it does not eliminate them altogether. Maintenance Tips/Suggestions: Catalytic converters do not require maintenance of their own, but their long-term livelihood depends on proper care and maintenance of your vehicle. As an example, if your vehicle begins to run rough, produces smoke from the tailpipe, or the SERVICE ENGINE SOON or CHECK ENGINE light appears, have it checked out immediately by a professional technician. This is especially true if the SERVICE ENGINE SOON or CHECK ENGINE flashes rather than being steadily lit. Neglecting these warning signs can cause expensive damage to the converter, requiring replacement. Symptoms of a faulty or failing converter may include failing an emissions test, poor performance, increased engine temperature, and bucking or hesitation. The primary purpose of a shock is to hold tires to the road, giving passengers a safer, smoother ride. They aren't just for comfort - they affect steering, road handling and braking of a vehicle, so they are very important for safety. Shocks become especially important in emergency maneuvers. 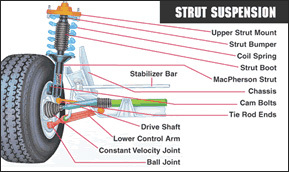 In newer cars that include struts instead of shocks, struts are compact, and allow for lighter vehicles and more interior room. They not only control the up and down movement of the tire, but contribute to the steering's pivotal rotation. 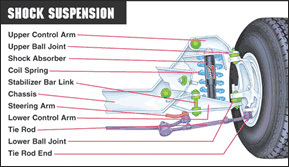 Driving with worn shocks and struts is as risky as driving on bald tires or using brakes that are past their prime. If you haven't checked your shocks lately then you should have them inspected. Follow your vehicle manufacturer’s maintenance schedule to save fuel costs and allow your car to operate more efficiently. Review your owner’s manual or visit Magic Mufflers & Brakes for a maintenance review. Your peace of mind and the savings to you for unnecessary repairs can be significant! GRAB A BITE TO EAT WHILE YOUR VEHICLE IS BEING SERVICED! Did you know that we offer a FREE shuttle service to some tasty restaurants in the Norcross area. We will drop you off and you can have a relaxing bite to eat while your vehicle is being serviced. We will then come back and pick you up when you have finished dining. Shown below are a list of restaurants that are supporting this new valuable service for our customers.